The Bear and Son Ninja II Boot Dagger may look like many other small combat knives, but the Ninja II carries an important difference. Most modern double-edged daggers provide one true cutting edge and one false edge. With the Ninja II, both edges of the blade are razor sharp. This fixed blade fighting knife's four-inch high carbon stainless steel blade includes a modern improvement many prefer as an option rather than a main edge. One side of the hollow ground blade is partially serrated for dealing with tough straps, rope, and cord, but the other side of the knife is plain-edged for smooth cutting. The knife's wide tang is fully enclosed by the black synthetic handle, and that extra grip width provides more leverage and control. The blade guard incorporated in the handle combined with the short unsharpened blade base could effectively parry an attacking weapon. With this type of grip, there's also little chance of the owner's hand slipping forward. Unlike many last ditch knives, the Ninja II is big enough to be practical for ordinary purposes. The extra heft that's a trademark of Bear and Son Cutlery should inspire confidence in the person who carries it. All parts of the knife are American-made by Bear & Son at the company's facility in Jacksonville, Alabama. The black leather sheath which comes with this eight-inch-long knife clips to either belt or boot, and at only eight ounces, the knife carries well by either method. 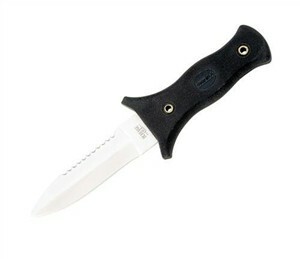 For a slimmer version of the boot knife, see the Kershaw Boot Knife.